If someone you love has died as a result of a motorcycle accident, it can be overwhelming to know what to do first, or what to do next. If you believe that legal counsel may be of benefit to you in any way, seeking out the right motorcycle accident attorney to help with your wrongful death claim may appear to be a daunting process. But it does not have to be so. Choosing a firm that has experience in motorcycle accident litigation is often the first and best choice because it means working with a firm with the experience required to handle your specific claim. If you’re located in the Inland Empire – whether you’re coming from Riverside or Corona, Rancho Cucamonga or Ontario – the right motorcycle accident law firm can really make a difference for you. Typically, in order to file a wrongful death claim, you have to first be of close relation to the individual who passed away in the incident. 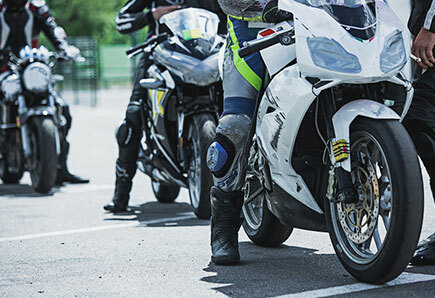 Generally, to file a wrongful death claim for a motorcycle accident, you should be the spouse, domestic partner or dependent of the individual who passed away. If you are under the age of 18 years old, then you must have your guardian handle the claim. If there is no spouse, and there are no offspring of the decedent, then typically whoever would otherwise inherit the estate is able to file a wrongful death claim. This could be parents, siblings, cousins, aunts or uncles, according to the rules of intestacy. Your attorney can help you determine whether or not you qualify to file such a lawsuit. The successful outcome of any filed claim will depend on where liability lies. In other words, it will need to be determined which party was at fault during the accident. The next step would be to establish that some negligence occurred at the time of the incident, causing the death of your loved one. If there is a way to prove that the defendant was negligent, thereby failing to abide by what is known as a reasonable standard of care, then the court may hold them accountable for damages in your wrongful death lawsuit. Determining damages can be difficult, and it is largely left up to the jury. There are different types of damages, including compensatory damages and punitive damages. Compensatory damages are provided to make up for what the victims have gone through as a result of the accident, while punitive damages are punish the punishing the defendant for wrongful conduct, if they are found negligent. Compensatory damages cover things like funeral costs, medical costs, property damage, pain and suffering, loss of wages, loss of future wages and similar costs. Punitive damages are paid over and above these amounts if they are awarded. If you have lost a loved one to a catastrophic motorcycle accident, you might have a wrongful death claim against the other parties involved. Call us today at Inland Empire Motorcycle Law by dialing (951) 290-3664 to find out more about the potential claim that you have, and what a motorcycle accident attorney can do for you as you deal with the aftermath of the accident.